ms in Japanese, and as you'll soon see, "candy" could be written in any of them, depending on what you mean by "candy here". In the case of a name, the writing for Candy in Japanese is going to look like below. The text is in a writing system called "katakana". You read it from left to right. It's quite similar to this writing system you are already familiar with. Each symbol represents a sound. For example the first one キ with two sticks parallel and another one going through both is read "KI". To enter this into photoshop, you would first need to install the Japanese input system. Then, switch into Japanese input mode and press the following keys: kyandexi and then press F7 to turn the characters from hiragana into katakana. 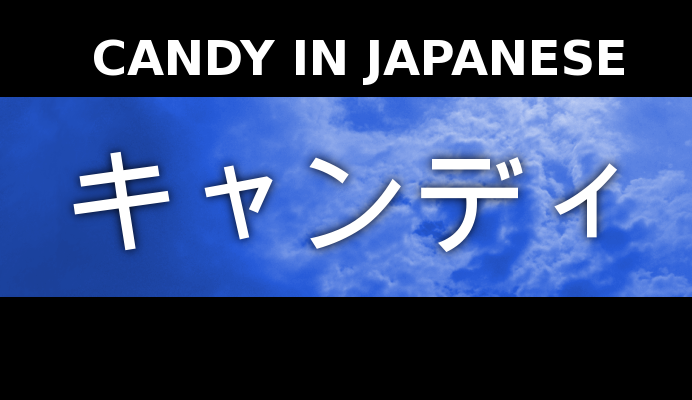 And there you have it, "candy" written in Japanese letters in your Photoshop. Now you might think it makes no sense that "Candy" would start with "KI". That's why in katakana there are smaller characters which modify how the previous character is read. The next one ャ means that the previous character should be read like "ya", meaning "KI" becomes "KYA". ン is the easiest. It just means the sound "N". So up to this point we now have KYA + N = KYAN. Pretty close to the beginning of Candy, just the end still misisng. The katakana character テ is read TE. But if you put two dots on the upper right, it softens the character, and it is no longer TE but becomes DE instead. After that there is again a small modifier ィ which says "you should read this character to that it ends in an I". All of this means that ディ is read "DI". Putting all that together, you get KYA + N + DI = KYANDI, which is pretty damn close to "CANDY" that we wanted. That's also probably as close as you can get, because there just isn't enough expressive power in the writing system to really represent all the sounds in the English word "Candy". All this time you weren't actually wanting to write anyone's name, rather you were looking for how to write the word meaning a sweet hard candy in Japanese. Well the term for that is "AME" and the character for it is 飴. That might look pretty complicated, but if you write it out stroke by stroke, it isn't so bad. Below is how to write it, step by step. I just quickly drew this with just using the mouse. In the bottom you can see the completed character. In the upper right is the first stroke you are supposed to draw. To the right of that is the next stroke to draw after that. You can see how each time a simple stroke is added, resulting to the final character. Please check another source for a bit more visualy pleasing way to write it. One interesting thing to note here is that what you just wrote does not represent just a sound. It represents the IDEA of a candy. The character you just wrote in a kanji character, which is a whole system of representing ideas using one symbol. If you have an image for every idea, wouldn't there be a lot of symbols? Yes! In Japanese there are thousands of symbols. There is a symbol for rain, a symbol for a human being, symbol for pain and even a symbol for love (愛). Even with a few thousand symbols it still isn't enough to represent any word, as there are ten thousands of words, but only thousands of symbols. What to do then? Then you combine two or more kanji to make an even bigger idea! Now with the combinations you can cover pretty much anything. For example the kanji for candy we just did (飴) alone does mean candy, but for example combined with the kanji meaning "shop" (屋), it suddenly means "candy store": 飴屋.